As the largest generation in U.S. history, millennials are quickly approaching the prime age for home purchases — spurring potential demand for home decorating, remodeling projects, and professional interior design services. To be successful, interior design marketing strategies must be customized to fit millennial motivations and mindsets. 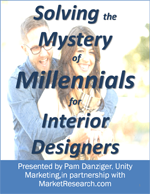 This new white paper is written for interior designers who want to know how to market to millennials effectively. Download this free PDF to learn data-driven insights from Pam Danziger of Unity Marketing, a renowned speaker, author, and market researcher recognized for her expertise on affluent millennials.